Regular readers of SpeakingDIRECT know that we are strong advocates for the effectiveness of direct mail, especially as part of a data-driven marketing campaign. 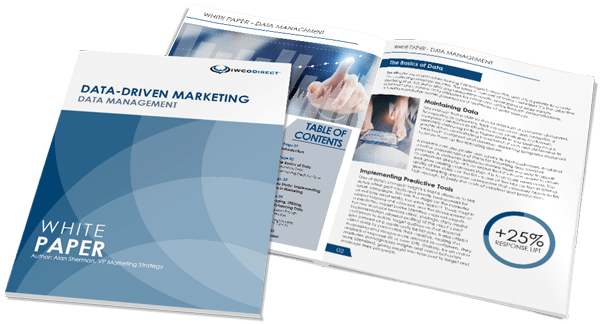 This is based not only on what we’ve seen in our own experience helping clients craft successful data-driven marketing mail campaigns, but also from what we are seeing in studies on the effectiveness of various marketing channels. Low response rates: Only about 10% of email ads are opened and 50% of users never click on online ads. Digital clutter: Consumers receive 520 email ads per month and email users see four times as many email ads today as they did in 2011. Ad blocking: 57% of desktop users have ad blocking software installed, meaning that 26 – 28% of online ads are blocked in the U.S.
Non-human traffic: Up to 37% of digital ad clicks are from bots and $7.2 billion will be wasted globally to bot traffic. Barrett’s analysis observes “[i]n a changing digital landscape, consumers continue to show more engagement and response to physical mail.” He notes the proportion of consumers who value mail and engage with it regularly has increased by 25% over the past five years. Barrett also highlights a study by the USPS Office of Inspector General, which found that physical mail triggers better recall over longer periods, creates stronger brand associations, and establishes deeper emotional connections with brands. Mail is a targeted, verifiable conduit to consumers. As my colleague Ashley Leone likes to remind us, marketing mail is a great tool to reach millennial consumers. Although millennials receive less mail than their older peers, they spend more time sorting and reading their mail each day, and they’re at least as likely to respond to advertisements in the mail as other age groups. In addition, Barrett’s research shows that 46% of millennials say they would check their mail more often when they have advance knowledge of what is arriving through Informed Delivery. Get in touch with us today to find out how to make marketing mail work for you and achieve your goals.